Stress has stitched itself into the fabric of modern life, slowly but surely weaving its way into the tapestry of our days. So many things worry us. So many things weary us. Where will we look for renewal? How can we restore the golden thread of peace into our lives? 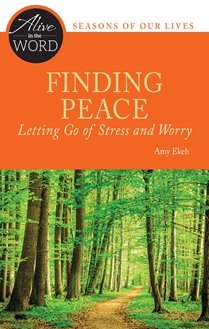 Finding Peace, Letting Go of Stress and Worry explores three New Testament passages, refreshing our minds and hearts in the love of God, our unity with Christ, and the peace that flows from loving one another. Amy Ekeh is an instructor in the Catholic Biblical School in the Archdiocese of Hartford, where she also facilitates retreats and missions. As a freelance writer, her work has appeared in St. Anthony Messenger, The Bible Today, Liguorian, Magnificat, and Catechist Magazine. She is the author of Advent, Season of Divine Encounter; and Lent, Season of Transformation (Alive in the Word series), That Mighty Heart, and In Every Life. Visit her blog at amyekeh.com.